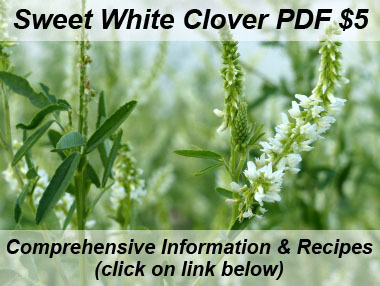 Sweet white clover is considered invasive in many areas. It's gangly appearance is easy to spot but often the aromatic scent is what gives it away. Interestingly, one plant can produce from 14,000 to 350,000 seeds. Most of the seeds remain viable in the soil for 14 to 20 years, and some seeds have remained viable for more than 80 years. It is typically a biennial plant and sometimes an annual or short-lived perennial. It is native to Europe and Asia. The first known record of this plant in North America is from 1664 in Boucherville, Quebec. 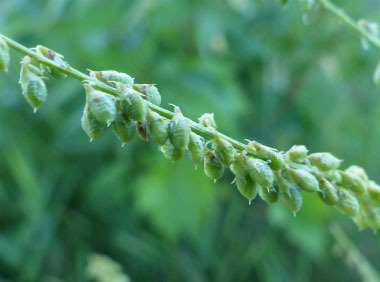 It was introduced as a forage crop and honey plant. It is a member of the Fabaceae family. Distinguishing Features: The gangly appearance of this plant is the first visual that catches the eye. 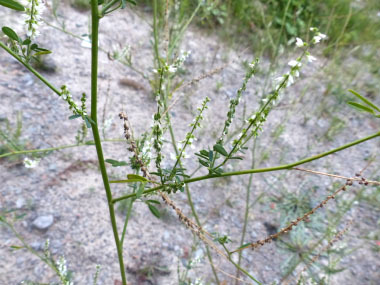 The three leaflets have an alfalfa-look and the racemes of flowers when in bloom make this plant unique. These flowers are a flurry of activity attracting many kinds of insects, including various species of bees, wasps, flies, butterflies, skippers, and beetles. 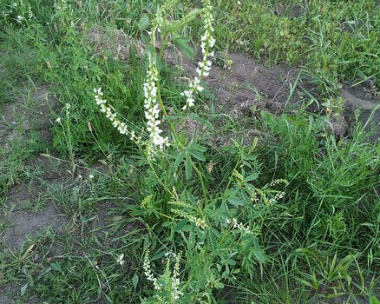 White sweet clover is considered an excellent nectar plant for Apis mellifera (honey bee) by beekeepers. 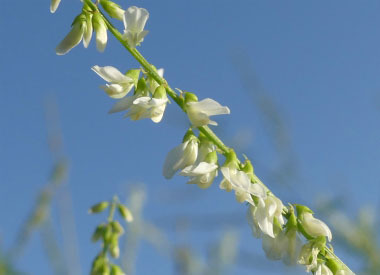 Flowers: Sweet white clover flowers appear from June to October in the plant’s second year in multiple racemes (clusters which are separate from the stem). They are white, 4-5 mm (under 1/4”) in size, and the flower stalks each have between 20 and 65 flowers. Each flower has 5 petals and a light green calyx with 5 teeth. The flower is tubular and becomes broader toward the outer edges of the petals. 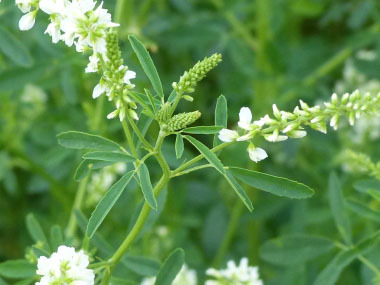 Fields of Nutrition has medicinal benefits and vitamin/mineral content of Sweet White Clover. Leaves: The leaves have three leaflets, and are alternate along the stem. Each leaflet is fully toothed. They can be hairy but are usually smooth. The leaves are 1 to 7 cm ( ½ to almost 3”) long. The middle leaflet has a distinct stalk. Height: Sweet white clover can reach to heights of up to 3 metres (9'). The stem is smooth,hairless, erect, and branched, grooved or channeled. The root crown produces somewhere between 1 to 10 stems. 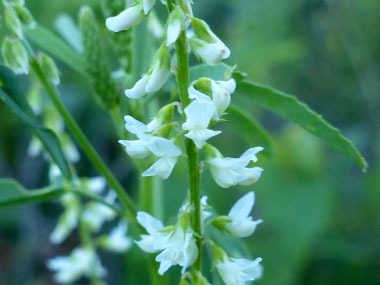 Habitat: Sweet white clover tends to prefer full sun and tolerates partial shade. It is often found on sandy, calcium-rich, alkaline soils, especially in open fields, meadows, prairies, roadside, mixedwood plains. It grows widespread across Canada, the U.S., Europe, Asia, Australia, New Zealand, and South America. Edible parts: Young leaves can be eaten raw or cooked preferably before the plant blossoms. They are bitter and aromatic, usually used as flavoring in salads. Young shoots can be cooked and used like asparagus. The flowers, raw or cooked, are edible. The whole plant thoroughly dried can be used to make a tea with a hint of vanilla. The seeds can be used as a spice. Consuming this plant occassionally or used as a spice is highly recommended. There is some research that indicates that regular consumption might have detrimental effects on the liver. It can causes bloating in some people as well. 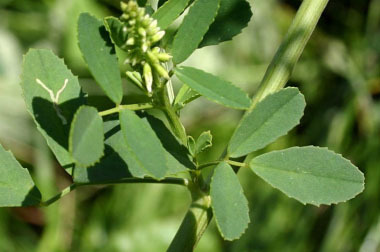 Similar plants: Melilotus officinalis, Medicago sativa. For more in-depth information (e.g. nutrition, medicinal values, recipes, historical information, harvesting tips, etc.) please check out our Sweet White Clover PDF magazine.